This area of the site is dedicated to posting updates for our project. We have made changes to algorithm and updated coin prices. Not finished rolling out updates. High end coin prices to be based more on current MS-65 than user set prices. After the updates a few things were broken. Both the user coin images, and the metal prices are working again. Members who are logged in can now make coin value suggestions. Dont like the values we have listed? Tell us what the real value is. We will review the request and make the proper changes. CoinPickers.com launched and we need your help! We are currently looking for knowledgeable people to write news, articles, and assist in the forums. Anyone can sign up today and become an active member in the forums. However...if you feel you have expertise in the coin, currency, finance, or the precious metal industry we are interested in posting your original content. Please post a message in the forum and we will contact you. UPDATE * * * CoinPickers project scrapped due to lack of finance, and support. The database had been corrupted. No data was lost the database just needed a repair ran. Don't worry. We back up data fairly regularly. Sorry for the scare everyone. We have notification tools to let us know when the server is down, but they don't check the status of all the db tables. We were just made aware of this issue. Please forgive us, sorry to scare anyone. The sidebar search that searches our entire coin database has been vastly improved. We fixed the upload image error... again. lol. Sometimes when you fix some issues you break others. That's what happened here. But the issue has been resolved now. Sorry for delay. 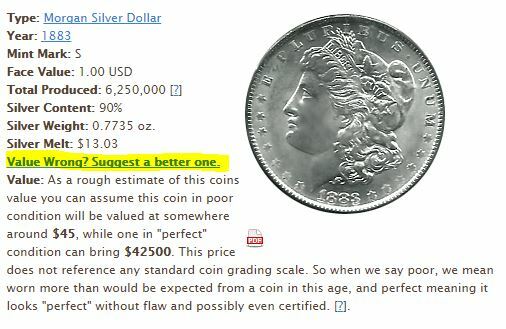 Error was setting standard value on non-error coins way higher as it thought the coins were steel. 5 bugs were submitted in regards to this error. Thanks for the heads up! Fixed coin collection error that was reported by sldr4god. All things seem to be in order now. If not please tell us :). An error was displayed when logging in, that is now fixed. It was really just a cosmetic fix, but it's a fix nonetheless. We we're notified this week about a bug that was assigning values and other details for half dollars to dollars. We've just fixed that error. We also streamlined the backend a bit. My coins collection preferences auto-save. The coins sorting order and coins per page are now auto-saving. If you prefer 50 coins per page instead of the default 10 coins per page just choose 50 and the system will remember your choice. This was requested several times in the feedback area. Thanks and be sure to tell your friends about our site! In the my coins section click on either the year, the mint, the type, condition, or value. It will then become an editable field! This was another popular feature people were requesting. The mapping and logging of "wild coins" that have been released into the general population has been fixed. We just noticed this error today and it is now fixed. After moving servers we had a few issues with the Gold/Silver price updates. This along with the metal price alerts has been fixed. If you've forgot your password it's no problem now. Just use the "Forgot Password?" link on the sign in form and follow the instructions. A handful of people have asked in one way or another for us to put a "none" option in the mint mark area of the user Add New Coin. So we did that. We had received a request to allow for users adding coins to add more than 1 of the same coin at a time. This option has been implemented. At the bottom of the form is the question how many. By default 1 is selected but if you want to add more than one you are welcome to. We've moved servers. The server the old site was hosted on was old and slow and we've moved to a bigger and better one.